"When I say it all began with monkeys, I don't mean to issue another rallying cry in the ongoing Culture Wars." Fast Food Nation meets The Corrections in the brilliant literary debut T.C. Boyle calls "funny and moving." 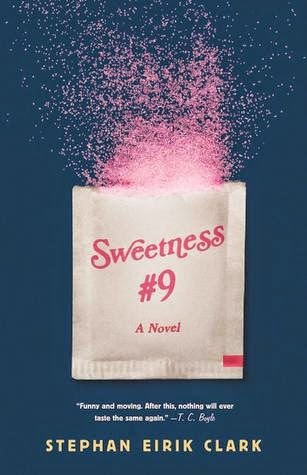 An exciting literary debut, SWEETNESS #9 is a darkly comic, wildly imaginative investigation of whether what we eat makes us who we are. This book was REALLY interesting. The concept was great! And the jacket description was, surprisingly, pretty spot-on: it did feel a bit like a combination of Fast Food Nation and The Corrections! I really ended up liking the novel, but I understand why AmberBug felt she couldn't quite get into it. I think it took a certain frame of mind, and for some reason I was there while reading this - although it DID take me an abnormally long time to get through. In any case, I would classify this hands down as a black comedy, which is right up my alley. I loved the book's close examination of the "American dream," with its cautionary tale about how trying to live up to expectations isn't always a good thing. David is an interesting character: a top student in the field of flavor science, who is initially glutted with job offers upon graduation. However, the job he takes is ultimately the one he abandons shortly after starting, due to concerns he has regarding the animal test subjects' reactions to the product he is testing, Sweetness #9. (Not ethically; he isn't worried about their welfare so much as how fat/thin/depressed/etc. they have become after consuming the artificial sweetener.) After serving a stint in a mental hospital (where he begins to question whether he actually saw what he saw), David is approached by another flavor house, this one established by a German expat who is said to have served Hitler his last meal. David settles into work (and a prosperous life) and everything seems to be smooth sailing through the American Dream ... until things start getting weird. I don't want to give everything away, though, so I'll let you read the book! I loved the historical perspective that this book lent the reader, not only on the WWII front, but also in that David's parents had been killed during the University of Texas clock tower massacre of 1966, which I thought was a very interesting bit to throw into the story. It's something I would never have thought to do as a writer, so I appreciated it immensely from Clark. Otherwise, this book is a great American Satire dream which spans the 1970s to the turn of the century, and I was especially fascinated because David's children were born around the same time I was, so it made everything much more easy to identify with. The characters in the book were all very vivid and distinct, ones I won't forget anytime soon. I would recommend this to those who enjoy black humor and a good, solid critique of the American industrial complex. Great review! I ordered this book, but not quite sure what to expect so it was interesting to read your thoughts. I didn't realize the story spanned a large period of time. Thanks! I hope you do enjoy it as much as I did. I didn't realize the book covered so many years, either, but it's not overwhelming the way it's done. It kind of takes place first in the 80s, then in the 90s. It's divided up well.